The model 4386 is considered a TRUE delay-on-break timing relay because it does not require any operating voltage or control switching to maintain the output contacts in a transferred state after operating voltage has been removed. When the operating voltage applied, the output contacts transfer and remain in this state until the operating voltage has been removed. 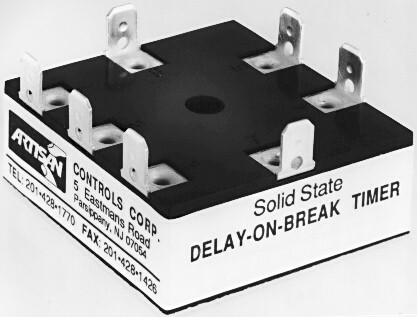 When the operating voltage is removed, the delay-on-break timing period begins. At the end of the timing period, the output contacts return to their de-energized state. timing relay because it does not require any operating voltage or control switching to maintain the output contacts in a transferred state after operating voltage has been removed. When the operating voltage applied, the output contacts transfer and remain in this state until the operating voltage has been removed. When the operating voltage is removed, the delay-on-break timing period begins. At the end of the timing period, the output contacts return to their de-energized state. Output Rating ULCSA - SPDT relay contacts, rated for 14HP, 125, 250V AC 8A 125, 250V AC, 8A 30V DC. Timing Adjustment Fixed (4386F) or Adjustable (4386A) from 0.5-300 sec. Timing Repeatability +/- 3% nominal. Operating Temperature -20 deg C to 65 deg C.
Frequency 12, 24, 48V DC, 12, 24V AC, 50 / 60 Hz.